Good stuff… any thoughts on the Trotter colum directly below it on the same page? nice cartoon, but it’s missing McCullay’s shepherds crook holding Key’s head to the teat. any thoughts on the Trotter colum directly below it on the same page? Yeah, I thought it was kind of insane. What on earth does Socialist Worker have to do with anything? Trotter has been a nutter all his life. After all he’s a socialist. With or without Clark Labour is doomed and will fall at the next election. Get ready to become the opposition. I actually have quite a bit of respect for Trotter as a writer, I just don’t think his analysis of the political game is much chop. His problem is that he presents as an insider when he actually gets all his information from the trade union bar in Auckland (he even admitted as much in his column today). Stick to the big picture stuff Chris. Trotter is a socialist? I just read his column and he seems to be attacking socialists and sticking up for the rich. Perhaps “from the left” is a misnomer. John Banks wants Clark to stay in power! “Auckland mayor John Banks is full of praise for Prime Minister Helen Clark after she announced a $30 million grant for Auckland Art Gallery’s redevelopment. The announcement was made at a function at the art gallery last night. Trotter was a well known fixture at Catherine Judds Awaroa Partners PR consultancy for friday night drinks. Trotter was the tame socialist let out of the zoo for the neo conservatives to gawp at much like Wellingtons Zoos leopards. Hey Mike – get back to work you lazy prick! mike sets a new standard for the inane. In case you missed it, ‘filth’ wasn’t merely about the fact that Clark was in a cartoon, or do the finer points escape you? 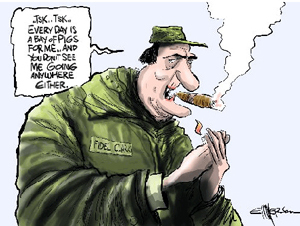 Cartoonist Tom Scott said he and his colleagues had to reflect reality and Clark was being treated no differently from David Lange or Jim Bolger in the last days of their tenure. I have no problem with the cartoonists being unkind. However an image of Helen as Castro and implying that she was capable of violating democratic principles was just “Filth“. Even the nats with their attempted rorting of the last election didn’t deserve that. Ancient are you taking the piss – or have you forgotten the EFA and the very recent Muldoon like actions over the Auckland airport. It seems to me that the authors on this site are so entrenched in the service o’f the present government that posts are solely in the vein of everything Labour and labours people do is fine and good while everything from the alternate side of the house is evil and corrupt if that’s what you truely believe and your nom de plume is true I’d humbly suggest your many years have taught you little. ’cause the EFA is exactly what they’ve got in Cuba, and you’d have to be taking the piss to suggest otherwise. I’m still waiting to see this higher standard HS. So bookie perhaps you like to explain how the EFA is not a violation of democratic principles then. It doesn’t stop anyone voting HS. But I understand your point. However unless you believe that there should be no laws around electioneering you can’t take an absolutist stand. It’s all about balancing tests and shades of grey. How about explaining how we are just like Cuba? AIA is required by most intellectual property exporters (like me) and a lot of agricultural exporters. Seeing it going downwards like other privatised natural monopolies like Telecom and its network, or Toll with the rail network isn’t acceptable to most exporters. EFA – well the Nat’s started the 2005 campaign well before the 3 month campaign period – especially with the billboards in march. They ran a campaign in association with concealed third parties. They also spent far more money over that extended period than they were allowed to. They violated the spirit of the existing legislation. The Auditor General then invalidated existing practices. So the parties pushed for a cleanup of legislation (including the Nat’s). The problem was that the Nats didn’t like some of the provisions specifically targeted at some of the practices put in by other parties including Labour. So they ran a failed campaign against it. In the end more MP’s voted for than against, and most parties voted for it. So why is that not democratic in a representative democracy? I expect governments to govern, and parliament to check question and modify. I don’t expect Farrar or his buddies to have any say in it – didn’t elect them. They are the anti-democratic ideologues. In particular in a country the size of NZ with inherent natural monopolies, the government has a duty to ensure that those are regulated for the benefit of all rather than just the benefit of shareholders. And you find that kind of government management worldwide for exactly that reason. I ask you a question – ignoring Muldoon, how often have national governments intervened in exactly the same way. Someone like Bolger or Holyoake would have done much same as Helen. You might like to point out to me where I said NZ is like Cuba and lighten up in terms of politica satire. Don’t know about that I was under the impression it was retunring healthy dividends to shareholders and it is undeniable that services and faclities at the airport have improved vastly over the last 10 -15 years. You’ll be surprised to hear that I agree that governement regulation is required in both these areas and that I pretty much agree with the line of the present governement on splitting telecom into separate units.